View More In Toaster Oven Cookware. Neeshow Healthy Heavy Duty Toaster Oven Pan, is made of pure 18/0 stainless steel, natural metal color and no coating surface, bring you a more healthy cooking experience. 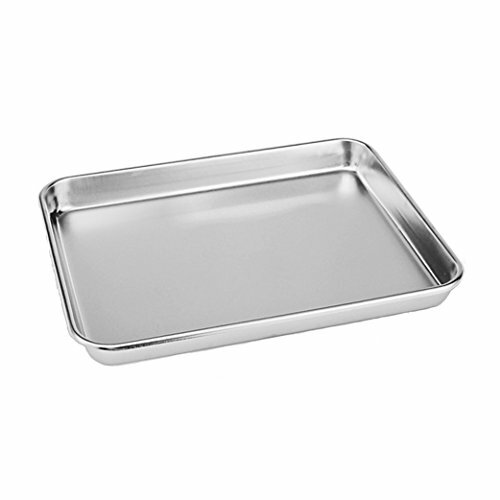 This pan is the perfect size for smaller servings. The compact size fits most toaster ovens. Easy storage and versatility. Cook your favorite meals or cookies. The superior mirror finish for easy and effortless cleanup. Dimension: 10'' x 8'' x 1'' Fit most toaster ovens. Thank you for taking Yooshome as part of your family. We guarantee that all the description and specification are 100% to the reality of product. We're working harder to offer more good items. We are Team, we go far, we are Yooshome. If you have any questions about this product by NEESHOW, contact us by completing and submitting the form below. If you are looking for a specif part number, please include it with your message.